Chester City: Brown (MacKenzie 63), Vaughan (Edmondson 63), McIntyre, Bolland, Hessey (Belle 18), Drummond (Carden 63), Collins (Hope 63), Ellison (Roberts 63), Harris (Davies 63), Clare, Branch (Rapley 63). Blackburn Rovers: Yelldell, Peers, Morgan, Danns, McEveley, Bruce, Harkins (Watt 73), Donnelly, Jansen, Gallagher, Douglas. Subs: Taylor, Drench, Johnson, Derbyshire. City fielded a strong line-up for their final pre-season friendly game against a Blackburn side who, like City, started the game unbeaten in their summer build-up. Michael Branch appears to have recovered from a bruised toe that kept him out of the previous two games and partnered Daryl Clare up front, while Kevin Ellison started his first game as a signed-up City player. 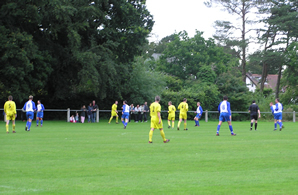 Ellison himself was first into the action as he saw a shot deflected wide after four minutes. Although a relatively young side, Rovers did boast Matt Jansen in the side, a veteran of over 100 Premiership games, and he had the visitors’ best chances on the night, shooting high and wide on both occasions. Goalkeeper Wayne Brown looked back to his best as well saving well low down from Jon Douglas as the half drew to a close. Chances were few and far between after the break, the better of the falling to the visitors though substitute Kevin Rapley had one effort saved. City made a host of changes midway through the second half bringing on no less than seven players to give the entire squad a run-out. So, both City and this particular Rovers squad failed to score for the first-time in the summer, on a night when honours were shared. Chester’s long-awaited return to Football League action is just days away now and manager Mark Wright has the makings of a squad that can, on their day, compete with the best in the division. An unbeaten run in pre-season will have given everyone confidence though City will have to take the field at Notts County without defender Kevin McIntyre who is suspended and striker Darryn Stamp who is recovering from a heel injury. There will also be doubts over Sean Hessey who went off injured against Blackburn with suspected concussion. Connah’s Quay Nomads: Simpson, Rain, Holmes (Elias 86), Spray (Gunther 55), Horan, Jellicoe, Mazzarella, Mutton, Williams, Cooke (Guy 86), Owen. Chester City: Brown, Vaughan (Hope 75), McIntyre, Warhurst (Hessey 65), Bolland, Collins (Edmondson 75), Harris, Davies (Carden 75), Rapley, Clare (Belle 65), Ellison (Roberts 65). Sub not used: Brookfield. City give a trial to experienced defender Paul Warhurst at Deeside Stadium while the Blues also welcomed back Daryl Clare to the forward line. The Blues were to dominate much of the match and almost opened the scoring on eight minutes when a neat lay-off by Kevin Rapley let in Kevin Ellison but he saw his shot saved by the legs of Simpson in the Quay goal. Five minutes later a far post Ellison cross was knocked down by Clare but the home defence cleared just before Rapley could add a finishing touch. Ellison was once again looking lively and he almost nipped in to open the scoring after being fed by Clare but the winger saw his effort go narrowly wide. The Blues took the lead on 33 minutes through Danny Collins who saw his initial shot from a Kevin McIntyre cross blocked before converting at the second attempt. City continued to look dangerous down the left with Ellison and McIntyre linking up well, while in midfield Ben Davies and Andy Harris looked solid. Quay defender rain had to be on his toes to clear a great Stephen Vaughan cross as predator Clare looked to pounce. City doubled their lead ten minutes into the second half with a great effort from Ben Davies curling in another 25-yarder, he almost added a third with a similar effort minutes later. As the home side tired towards the end of the game City created numerous chances. Stuart Roberts shot wide after good work by substitute Cortez Belle. Belle also did well to get to a cross from Roberts but his header went wide. As on Tuesday night, City’s best chance fell to Belle on 80 minutes when a deflected McIntyre cross dropped over the keepers head but he was unable to produce a final touch from a couple of yards out. In the last minute a terrific through ball from Hessey sent McIntyre away but Belle failed to make good contact at the near post from the resulting cross. Chester City: MacKenzie, Hope, Cooke (D.Jones 83), Edmondson (Hunter 83), J.Belfortti [trialist] (Lathom 54), Hessey, Roberts [trialist] (Rutherford 83), Carden, Lucas [trialist] (Belle 54), Booth (Walsh 75), Thil [trialist]. Sub not used: Brookfield. 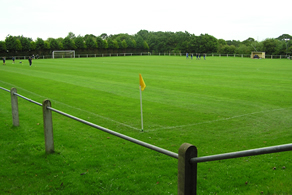 City fielded three overseas trialists in this latest friendly match at Gayton Park. Argentinean Joseph Belfortti played in the centre of the defence, Australian Jay Lucas (ex-Southampton and Australian side Wollongong Wanderers) played up front as did Frenchman Gregory Thil (Beauvais FC). It was Thil who scored City’s goal on 37 minutes, equalising an earlier effort by Kieran Fleetwood for the home side on the quarter hour, to send the teams in at the interval level. Chester had the better of the chances after the break and Thil, Booth and Stuart Roberts all saw efforts cleared of the line. Paul Roberts in the Heswall goal prevented City securing a comfortable victory with a series of outstanding saves particularly one from Thil early in the second half when he saved a volley from point-blank range. Cortez Belle missed the best chance in the dying minutes blasting over the bar after his initial good shot was saved. Thil, who saw a shot hit the post in the first half, along with Stuart Roberts and Robert Booth all impressed in this latest run-out for the Blues. 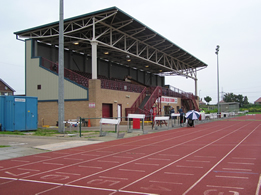 Next up are Connah’s Quay Nomads at Deeside Stadium on Thursday night, kick-off 19:30hrs. Chester City: Brown, Edmondson (Vaughan 70), McIntyre, Bolland, Hessey (Belle 70), Weller [trialist] (Davies 19), Collins, Roberts, Harris (Carden 70), Rapley (Sheron [trialist] 70), Branch. Subs not used: MacKenzie, Hope. Queen of the South: C.Scott, Chris Scott, English, McColligan, Reid, Thompson, Bagan (Wood 46), Bowey, McNiven, Payne (Burns 46), McLaughlin (Gibson 64). Subs not used: Beattie, Sampson, Pearson, McGinlay. Despite dominating long periods City had to be content with a share of the spoils against Queen of the South as the visitors fought back well in the second half. Paul Weller and Stuart Roberts were again give a run-out, with Stewart Drummond and Daryl Clare notable absentees from the side that played on Thursday night. It was just before the quarter hour mark that City took the lead though a Michael Branch header after a mix-up in the Queens defence. Branch has had an impressive pre-season so far having netted four goals in three games now. City comfortably held the lead until half-time, squandering several half-chances along the way. The Blues faithful, for once sporting new-look replica shirts in time for the season start, didn't have to wait long for the second goal which came from a Ben Davies long-range effort on 49 minutes, Davies having replaced Weller midway through the first period. 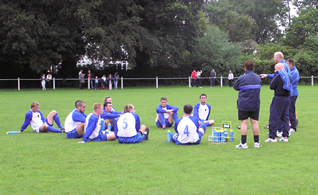 City eased off and were made to pay just after the hour mark when Queens substitute Wood headed home from close range. Manager Mark Wright range the changes with Stephen Vaughan, Cortez Belle, Paul Carden and Mike Sheron replacing Darren Edmondson, Sean Hessey, Andy Harris and Kevin Rapley. However the Blues were caught out again two minutes after the personnel change as another substitute Burne slotted the ball past Brown from the edge of the box to tie the score up at 2-2. 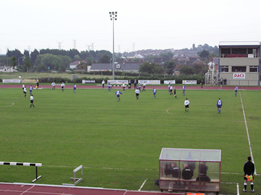 Colwyn Bay: Parry, P.Roberts, C.Roberts, Coverley, Morris, Garside, Orlik, Rodgers, McIlvogue, Fisher-Cook, Maloney. Subs: Dews, Davies, Chesters, Hoyle, Redmond, Nottage. Chester City: MacKenzie, Vaughan, McIntyre (Lathom 81), Belle, Hessey, Hope, Drummond (Booth 81), Carden (Walsh 81), Sheron [trialist], Clare (McCoy 81), Davies. Subs not used: Brown, Edmondson, D.Jones, Lynch, Rutherford. A goal on 56 minutes from Daryl Clare gave City their third pre-season victory. City fielded a strong side and welcomed both Daryl Clare and Paul Carden from injury and it took Clare just seven minutes to get into the thick of the action, hitting a post with a header from a Mike Sheron cross. Just before the half-hour mark midfielder Stewart Drummond saw a shot well parried by Parry in the Bay goal, the loose ball fell to Ben Davies who put his shot over the bar. Two minutes later City hit the woodwork again. Davies put through Sheron whose shot was pushed onto the post by Parry. The home side were fielding two ex-Chester players in Paul Roberts and Carl Rodgers, and the nearest they came to taking the lead in the first-half came on 36 minutes when a Maloney shot was deflected over the crossbar by Richard Hope. Five minutes before the break Clare shot wide after the ball had broken clear following Hope's good run from defence. City made no substitutions at half-time and almost fell behind as McIlvogue headed wide after outjumping Belle. A minute later though City took the lead after a short spell of pressure. Sheron had seen a shot deflected round the post and from the resulting corner Clare headed home McIntyre's cross. Minutes later Stephen Vaughan had a chance to double the lead but saw his shot saved by the keeper's legs after he had been put through on goal by Drummond. Carden sent Sheron through with a superb defence-splitting pass, but the striker currently on trial at the Deva shot straight at Parry. Manager Mark Wright made four substitutions as the game entered the final ten minutes but City held on firm to register their third pre-season victory and a third clean sheet with it. Chester City (First half): Brown, Handyside [trialist], Vaughan, Hessey, Collins, Weller [trialist], McIntyre, Ellison [trialist], Harris, Rapley, Sheron. Chester City (Second half): MacKenzie, Edmondson, Belle (Collins 84), Bolland, Hope, McIntyre, Davies, Drummond, Roberts [trialist], Stamp (Hessey 63), Branch. Cardiff City: Margetson (Warner 45), Weston (Anthony 77), Croft, Boland (Page 45), Collins (Kavanagh 45), Gabbidon, Robinson (Bolland 67), Bullock, Lee (Campbell 45), Earnshaw (Thorne 45), Parry (Baker 15). Another encouraging win for City as a Mike Sheron strike on the stroke of half-time and a third pre-season goal from Michael Branch bring City a deserved victory over higher league opposition. City manager Mark Wright included in the starting line-up trialist Paul Weller form Burnley who joined Peter Handyside, Kevin Ellison and Stuart Roberts all out to impress and try and earn a contract for next season. 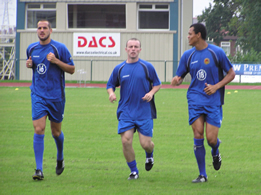 The visitors, Cardiff City, brought a strong squad to the Deva for what was their first pre-season run-out. City started brightly and it was Kevin McIntyre, who, as on Saturday looked lively down the wing creating trouble for the visitors. Kevin Rapley also forced a great save from Margetson who pushed his shot round the post after City had wrestled the ball from the Bluebirds defence. The closest the visitor cam t opening the scoring was from a long range Earnshaw lob that cleared the City crossbar. At the other end Kevin Ellison threaded a dangerous cross into the box, after good work on the left, but no City striker could take advantage. Chester took the lead on the stroke of half-time with Sheron curling home a delightful 25-yarder after good build-up play by Kevin’s Ellison and Rapley. As on Saturday, a whole host of substitutions were made with ten new players being introduced by Wright for the second period. 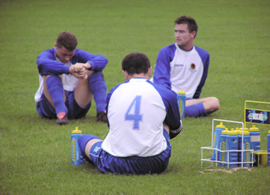 Only Kevin McIntyre went on to play the full 90 minutes though injuries later in the game to both Cortez Belle and Darryn Stamp meant a return for Danny Collins and Sean Hessey. Kavanagh saw a shot hit the bar for Cardiff before The Blues doubled their lead on 69 minutes when Branch saw his close range shot deflected home following a Ben Davies cross following a short corner. One black spot was the booking of Darren Edmondson for a hefty second-half challenge. Next up for City is a trip to Colwyn Bay on Thursday night (kick-off 19:30), followed by the visit of Queen of the South to Deva Stadium on Saturday, kick-off 15:00hrs. Chester City (First half): Brown, Vaughan, McIntyre, Bolland, Collins, Drummond, Branch, Ellison [trialist], Harris, Belle, Stamp. Chester City (Second half): MacKenzie, Edmondson, McIntyre, Handyside [trialist], Belle, Hope, Roberts [trialist], Davies, Harris, Sheron [trialist], Rapley. Walsall: Paston (McKinney), Bazeley (Willetts), Aranalde (Dann), Emblem (Bennett), Roper (Dakinah), Osborn (Jameson), Wrack (Atieno), Standing (Corica), Leitao (Fryatt), Merson (K.Taylor), Birch (D.Taylor). First half goals from new signings Michael Branch and trialist Kevin Ellison gave Chester a comfortable victory in City’s opening friendly against Paul Merson’s visiting Walsall. In what was a showcase match for most of City’s new signings, Chester prised open a suspect Walsall defence in what was predictably a game scattered with substitutions and half time team swaps. A goal as early as the third minute Chester provided just the start we needed when Ellison met a Darryn Stamp centre from the right leaving the visitor’s goalkeeper flatfooted. In a game played at pre season pace, Collins, Bolland carried on where they had left off last season with a well organised and comfortable display allowing Cortez Belle to fit in nicely where Guyett had left. Indeed Chester was indebted twice to Belle with two timely headers on the few occasions Walsall advanced. In midfield Stuart Drummond looked as if he had been part of the team for some time with economical running and some timely tackles. Often unassuming it is likely he will play a key part in City’s success over the next season. But it was Branch who proved to be their un-doing with two strikes in the last fifteen minutes of the half. Moving from the left to the right side of the field he nearly opening his account with a near post strike that their goalkeeper did well to parry just wide. Two minutes later though he got his just desserts directing a header firmly wide of the goalkeeper from again from a well placed McIntyre centre from the right. And just as we were settling for a 2-0 half time score, he scored his second with the best goal of the game connecting sweetly with the ball as it came over his head from a midfield punt as he raced clear. Although the margin may have flattered City, there was no doubt Chester were by far the sharper side. While Merson made some clever runs with a few nice turns of pace, he was not able to create proper openings nor did the rest of his team really threaten. Credit too to Wayne Brown returning after what seemed like an eternity away from first team action gave a confident display of handling on the rare occasions he needed to. The second half was more subdued. Kevin Rapley and Mike Sheron both appeared alongside Richard Hope, Darron Edmonson and Ben Davies making way for Stephen Vaughan Stuart Drummond and Michael Branch. Two trialists were also introduced, Peter Handyside and Stuart Roberts. Although Chester coasted some of the early shape was lost allowing Walsall to come into the game. And while Chris MacKenzie, in goal had more to do for Chester than Brown in the first half there were few real moments of panic. Chester’s Andy Harris was also busy and deserves mention for his sensible distribution playing with greater confidence as the game went on. As the final minutes ticked away there was almost a fourth goal to celebrate when Ben Davies thumped an unstoppable stop against the crossbar. But it stayed at three nil and the fans many enjoying their first outing since the Scarborough game will have gone home satisfied. There was much for the crowd of 1,335 to take from of this game. Branch in particularly looked sharp, Ellison’s pugnacious display can only have helped to secure a permanent contract, and Cortez Belle looked strong and promising. We are likely to see more of him and a nineteen offers great promise. Followers of Bradford City’s fortunes will be interested to know that their former goalkeeper Mark Paston and New Zealand international, off loaded like Michael Branch during summer played his first game for the Saddlers and although blameless for the goals will be keen to forget his part in this match. As for the rest of the Walsall team, they will need to sharpen up, though Corica hit the crossbar for Walsall in the second half which was their best chance. Their own website describes their performance as “disappointing” and might explain why during the first half a small number of fans ended up fighting amongst themselves providing the only significant challenge for the stewards. On a final note of nostalgia, for those that remember it was nice to see Jim Walker, Chester’s former defender back at the club joining up with Paul Merson as Walsall’s physiotherapist joining after a long spell at Villa Park.